Hyaluronic Acid is a natural component of our skin and one of the main moisturizing factors. By using synthetic hyaluronic acid, fine face lines and wrinkles fade or even erase. 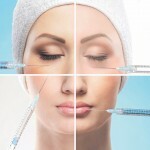 The substance (hyaluronic acid) is injected, filling the wrinkles. Its density depends on how deep the wrinkle is. The same filling material, in different density and texture, is also being used in contouring or enhancing the lips. The effect lasts 6 to 12 months and it is almost painless.